Inspired by the "elixir of youth" used by Queen Isabelle of Hungary, this skincare smoothes features, tightens pores and provides an instant burst of radiance to the complexion. Spray on before applying your cream, or at any time of the day for an immediate energizing sensation. Aqua (Water), Alcohol denat, Glycerin*, Rosa Damascena Flower Oil *, Rosmarinus officinalis (Rosemary) leaf Oil *, Potassium Alum, Citrus Aurantium Amara (Bitter Orange) Flower Water *Citrus Aurantium Dulcis (Orange) Floweroil *Mentha Piperita (Peppermint) Oil *Commiphora Myrrha Extract *Styrax Benzoin Resin Extract *Melissa Officinalis (Balm Mint) Leaf Oil *Vitis Vinifera (Grape) Fruit Extract *Citral Citronellol Farnesol Geraniol Limonen Linalool. Honestly, the one thing you need to wake you up in the middle of the day! The rosemary is so grounding and the peppermint is so refreshing! Love it as a makeup setter. Set your makeup and give yourself a boost all at the same time. Pleasant smell, easy to carry, convenient to use, more important, it's not greasy and absorbed fast. This product is the perfect size to carry in my purse to refresh on a hot summer day or after a workout. It feels great and does not disturb my makeup. Plus, I know I'm enriching my skin with antioxidants. Love it! Highly recommend! Cute travel size, very practical! This product is so amazing! It truly balances out and tones my skin. I love how it not only comes in the larger size, but this size as well. I always carry this size in my purse and it's excellent for mid-errand refreshment. I highly suggest everyone owns this! My favorite travel item!! 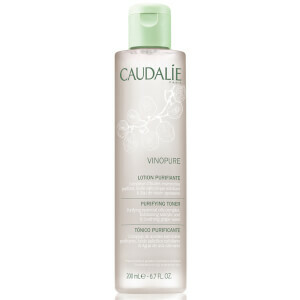 I love many Caudalie products, but am underwhelmed by this one. Sure it's refreshing, but burst of radiance? No. And I don't see any tightening effect. Not worth the price. I bought the kit and loved every product in it! I especially loved the elixer, it has such a clean fresh scent. I plan to order full size products on my next order.